With all the talk of the cloud in today’s POS market, you might wonder if anything isn’t in the cloud today! At SelbySoft, we try to offer the best of both worlds when it comes to the cloud. SelbySoft prefers to have your data held locally in your store(s) location. Not on a rented Amazon server like most cloud based POS systems. This leaves you in control of your POS data and eliminates the possibility of being held hostage by a bad internet connection. Your SP-1 system will continue to work without any internet connectivity at all. 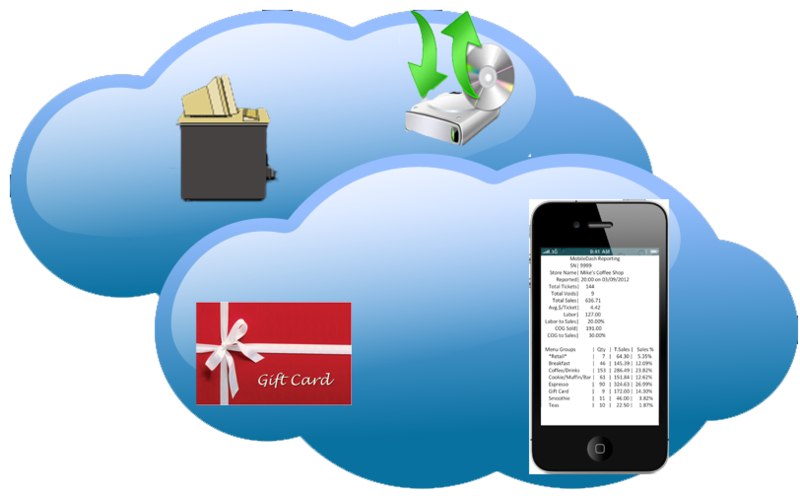 FREE cloud based backup. That’s right – we supply a cloud based backup for all of our customers that are on a support system. This means that your data is backed up to a secure server in the case of a catastrophic event. Gift & Loyalty. Traditionally we recommend keeping the gift card data on the POS system. This can be moved to the cloud where we will keep the gift and loyalty amounts securly. MobileDash Reporting. Reporting from the cloud right to your smartphone! Corporate Offerings. Full corporate reporting and menu management from a central location.